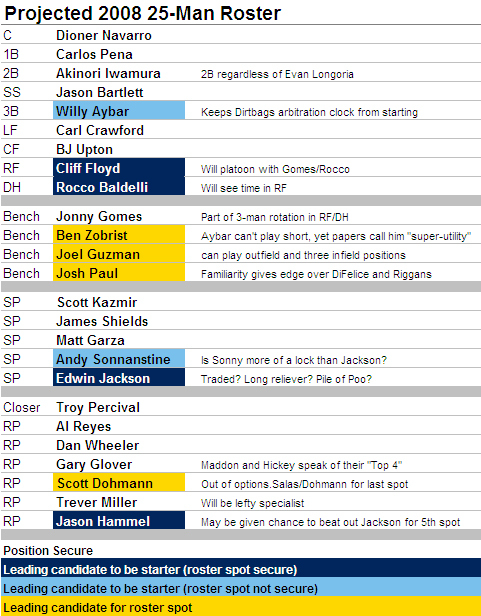 We are now less than a week away from Spring Training and after a couple of more free agent signings, we now have a much better idea of what the 2008 Tampa Bay Rays roster will look like. Lineup: Now that Willy Aybar’s legal issues are behind him, it looks once agains as if he is either the starter or in a platoon with Joel Guzman at third base. However, we do give Eric Hinske an outside shot at winning the job in spring training. Again, none of this should have a bearing on what the team decides to do with Evan Longoria, as the team will do what they think is best for Longoria and not what is best for the opening day lineup. However, all signs indicate a start to the year in Durham. Bench: Jonny Gomes is the only lock and he really isn’t part of the bench. He will be in the lineup most days in right or at DH. The rest of the bench is undecided, but Josh Paul and Ben Zobrist are pretty close to locks. Zobrist is really the Rays only available backup middle infielder and Paul is familiar with the staff. Guzman on the other hand could be the starting third baseman, part of a platoon, on the bench, or off the team. He is he big question mark. Rotation: Not much has changed. Top 3 are locked in. Andy Sonnanstine is pretty close. That leaves four pitchers (Edwin Jackson, Jason Hammel, Jeff Niemann and JP Howell) for one spot. That is a nice predicament to have. If the season started today, we go with Jackson, but we are going to keep a close eye on Niemann. It is our feeling that the team wants Niemann to win this spot. He will be 25 and it is time to see what he can do. Bullpen: The signing of Trever Miller fills one of the last remaining open spots on the roster. Jim Hickey’s recent comments about Gary Glover gives five players guaranteed jobs. One of the last two relief spots will go to one of the “losers” of the starting rotation battle. That leaves one spot in the bullpen up for grabs. Juan Salas? Scott Dohmann? Grant Balfour? Your guess is as good as ours. Does Jackson have options left? If he gets beat out for the final fifth spot would he be the long releaver in the bullpen or do you think the rays might try and make a closer out of him or something. Yessir. Jackson is out of options. That is why we give him the edge for the final spot at this time. Let's ignore Niemann for a second. Howell is a longshot for anything. Sonny looks like a lock for one spot in the rotation. I think Maddon saw enough last year. That means Jackson and Hammel for the final spot.Winner gets the 5-spot. Loser theoretically goes to the 'pen. Now I would not rule out Howell for the 'pen, but I gotta figure the Jackson/Hammel loser (both out of options) has the edge. Niemann is the wildcard. Let's say he dominates spring training. That means Jackson OR Hamell is the long reliever (Howell is def back at AAA in this scenario). Only one spot and both are out of options. The Rays HAVE to trade one. Jackson is the easier piece to trade. Jackson will be traded. Hammel is the long reliever. I guess there is a scenario in which Hammel is DFA'd, and Jackson is in the 'pen, but that is a longshot. 2. complex scenario (but one i think the Rays would prefer): Niemann in the rotation. Jackson traded. Hammel in the 'pen. I would rather see Hinske on the roster than Guzman if it's a back-up role. Guzman is out of options. the Rays would have to trade him or release him. Hinske can be sent to the minors. but only until sometime in June. Then the team has to bring him up or release him (if he asks). I am unsure who i would prefer. I think that Guzman has a higher upside and a better glove. Then again, I would trust Hinske in a tough spot because he has more experience.